We know that when the MOT testing service is unavailable, your priority is to get a contingency code so that you can carry on working. So that’s why we’ve created a new page which you can visit to see the service’s current status. On the status page, you’ll be able to see if there are any problems with the service. You’ll also be able to get a contingency code if you need one. So if you’re experiencing any problems with the service, make sure to check this page first. If the page says the service is running normally and you're experiencing problems this could be because you’re the first to find the issue so please let us know about it by calling the service desk. If you can’t access the service status page or the MOT testing service you might have a problem with your IT. You’ll need to be connected to the internet to get on the service status page, so if you can’t get on it, or any other websites, your internet provider might be experiencing issues. You’ll find this page on the ‘Matters of Testing’ blog. It isn't part of the MOT Testing Service, so you’ll still be able to access it even if we have problems with the MOT Testing Service. To access this page, click on the link called ‘MOT testing service status’ - you’ll find this on the right-hand sidebar on Matters of Testing under the ‘More Information’ section. When we have maintenance work planned we’ll send you an email and update the new status page to let you know when the service will be unavailable. If the service goes down unexpectedly we’ll update the status page as soon as we can. Unplanned outages can be for a number of technical reasons and as soon as we know about the problem we try to fix it as quickly as possible. We want to make sure you know the status of the service straight away and our new status page will help you to access this information instantly. In the past, when the MOT testing service was unavailable we’d receive a high volume of calls to the service desk to get a contingency code. This meant it was often hard to get through and speak to anyone. As we’ll post a contingency code on the status page if ones needed, you shouldn’t need to call the service desk to get one. So why not make the status page the first place you check. If you’re experiencing issues with the service and you’ve already checked the status page, then you can call the service desk for help. You shouldn’t call the service desk if you have any questions about the MOT scheme or testing standards. If you have any enquiries like this then please contact DVSA. Please let us know what you think and what improvements we could make to the page. Is there any other information you’d like to see on there? Let us know in the comments. I see you have now lowered our site risk to amber yet we have not hand a site assessment since 2011 and our monthly reports show no obvious problems or changes from the norm why has this change been made ? Thomas Thanks for the response. In the real world of running a business, to get the best from staff and any system of work you need to encourage and guide. Its very damaging to reprimand with out good reason and you will find that the people who are working hard trying to improve and work with new systems get very despondent which will create further problems for all . just received email about new webpage address,printed out the poster,what a waste of ink ,why have a massive blue background and then all it tells you is the www. address,why are we ow changing this ,we have everything set up and bookmarked now we have to sort this out there is an old saying in the motor trade that maybe your it lads could listen to IF ITS NOT BROKE DONT FIX IT !!!!!!!!! Am I still going to get an email up to 2 hours later with a contingency code? The page is on the Matters of Testing blog and it should be able to handle large amounts of people trying to access it at once. We'll still email you to let you know when the service is going down and we'll also send out contingency codes by email if we need to. 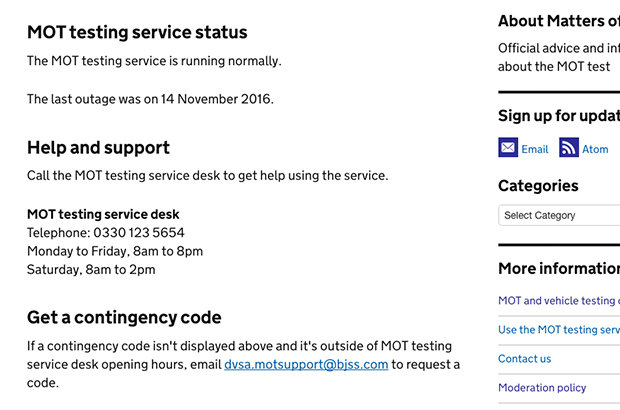 The status page is just an extra place that you can now check if you're having any issues with the MOT testing service. What about when YOUR site goes down, as it did earlier this month on a saturday morning? There seems to be too much reliance on the internet, are there any plans to text the contingency code in the event of server failure? also, the phone system, when you finally dont get an engaged tone it allows to go through all the selections and then tells you no one can answer the phone and cuts you off!!! This new page is on Matters of Testing not the MOT testing service. So even if we have problems with the MOT Testing service you’ll still be able to access the new status page. Is there any possible chance that a government department could actually come up with a system that allows the people that are employed to carry out a certain task ie MOT testing to get on with the job and not in becoming IT experts? That should (hopefully) be a big improvement, as it was a nightmare to get through to get the contingency code, in the end we had to rely on someone else getting through and them passing the code around. I take it we can book mark the status page, so we can go straight to it rather then going through Matters of Testing every time.